Thousands of years ago, during the height of the ancient Greek and Roman empires, lead emissions from sources such as the mining and smelting of lead-silver ores in Europe drifted with the winds over the ocean to Greenland—a distance of more than 2800 miles (4600 km) - and settled onto the ice. Year after year, as fallen snow added layers to the ice sheet, lead emissions were captured along with dust and other airborne particles, and became part of the ice-core record that scientists use today to learn about conditions of the past. In a new study published in PNAS, a team of scientists, archaeologists and economists from the Desert Research Institute (DRI), the University of Oxford, NILU—Norwegian Institute for Air Research and the University of Copenhagen used ice samples from the North Greenland Ice Core Project (NGRIP) to measure, date and analyze European lead emissions that were captured in Greenland ice between 1100 BC and AD 800. Their results provide new insight for historians about how European civilizations and their economies fared over time. "Our record of sub-annually resolved, accurately dated measurements in the ice core starts in 1100 BC during the late Iron Age and extends through antiquity and late antiquity to the early Middle Ages in Europe—a period that included the rise and fall of the Greek and Roman civilizations," said the study's lead author Joe McConnell, Ph.D., Research Professor of Hydrology at DRI. "We found that lead pollution in Greenland very closely tracked known plagues, wars, social unrest and imperial expansions during European antiquity." A previous study from the mid-1990s examined lead levels in Greenland ice using only 18 measurements between 1100 BC and AD 800; the new study provides a much more complete record that included more than 21,000 precise lead and other chemical measurements to develop an accurately dated, continuous record for the same 1900-year period. To determine the magnitude of European emissions from the lead pollution levels measured in the Greenland ice, the team used state-of-the-art atmospheric transport model simulations. "We believe this is the first time such detailed modeling has been used to interpret an ice-core record of human-made pollution and identify the most likely source region of the pollution," said coauthor Andreas Stohl, Ph.D., Senior Scientist at NILU. Most of the lead emissions from this time period are believed to have been linked to the production of silver, which was a key component of currency. "Because most of the emissions during these periods resulted from mining and smelting of lead-silver ores, lead emissions can be seen as a proxy or indicator of overall economic activity," McConnell explained. Using their detailed ice-core chronology, the research team looked for linkages between lead emissions and significant historical events. 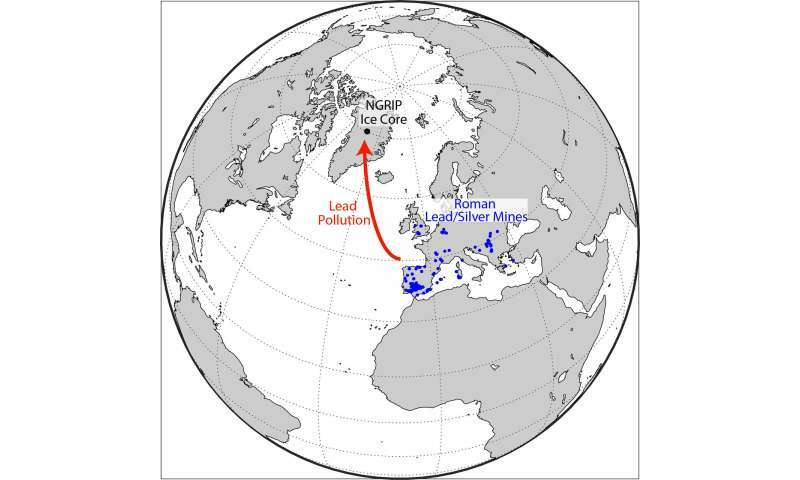 Their results show that lead pollution emissions began to rise as early as 900 BC, as Phoenicians expanded their trading routes into the western Mediterranean. Lead emissions accelerated during a period of increased mining activity by the Carthaginians and Romans primarily in the Iberian Peninsula, and reached a maximum under the Roman Empire. The team's extensive measurements provide a different picture of ancient economic activity than previous research had provided. Some historians, for example, had argued that the sparse Greenland lead record provided evidence of better economic performance during the Roman Republic than during the Roman Empire. According to the findings of this study, the highest sustained levels of lead pollution emissions coincided with the height of the Roman Empire during the 1st and 2nd centuries AD, a period of economic prosperity known as the Pax Romana. The record also shows that lead emissions were very low during the last 80 years of the Roman Republic, a period known as the Crisis of the Roman Republic. "The nearly four-fold higher lead emissions during the first two centuries of the Roman Empire compared to the last decades of the Roman Republic indicate substantial economic growth under Imperial rule," said coauthor Andrew Wilson, Professor of the Archaeology of the Roman Empire at Oxford. 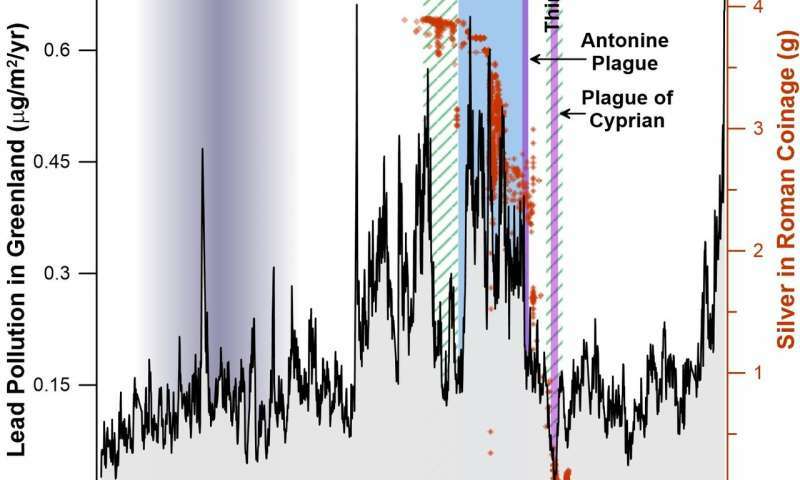 The team also found that lead emissions rose and fell along with wars and political instability, particularly during the Roman Republic, and took sharp dives when two major plagues struck the Roman Empire in the 2nd and 3rd centuries. The first, called the Antonine Plague, was probably smallpox. The second, called the Plague of Cyprian, struck during a period of political instability called the third-century crisis. "The great Antonine Plague struck the Roman Empire in AD 165 and lasted at least 15 years. The high lead emissions of the Pax Romana ended exactly at that time and didn't recover until the early Middle Ages more than 500 years later," Wilson explained. The research team for this study included ice-core specialists, atmospheric scientists, archaeologists, and economic historians—an unusual combination of expertise. "Working with such a diverse team was a unique experience in my career as a scientist," McConnell said. "I think that our results show that there can be great value in collaborating across disciplines." After the Roman Republic was debased, it took several centuries to recover, and then that growth was short lived...as the 'Empire' based only on 'might makes right' soon collaped under invasion of Rome by its 'disciples' who also believed the same and sacked what was Rome over and over. Would that the study researchers conduct some longer based studies to show if there were any very old civilizations, like between the ice ages too!. Have a feeling that there is a lot of hidden history out there that no one is looking for. Far too many are parroting the fables about the pyramids being constructed by primitive peoples when many such, like in china and Peru, contain technology never possessed by the primitive Peruvians, Chinese, or Iron age Bosnians who have one of the largest in the world, overgrown like a mountain until discovered from above. There are possibly some other places in the world in the pollution drift pathways of said cultures that could be discovered in this way. The problem is money and likelihood of finding. However if such had never been 'found', then no one may even look. Thatis why we have so many 'anomalies' like iron claw happers over 50 million years old, and pyramids in Antarctica. And by the way, ask the Russians about Lake Baikal!